Cover beans in water; let soak overnight (night before making the recipe). Cook beans in same soaking water and stir in half the oil. When the beans are soft, add the salt. Meanwhile, cook ground beef in oil, stir in half the hogao; stirring well. Crumble bacon and fry chicharrones. When beans are tender, stir in remaining hogao and cook 5 to 10 additional minutes. In skillet add oil over high heat , carefully fry sweet plantains or tostones ; fried the eggs. Serve dish in trays with rice, avocado and arepas. Hogao o Guiso: Mix all ingredients together and cook in skillet for 10 minutes. Arepas: Place corn arepa flour in large bowl enough to knead in it. Stir in oil over flour. Stir in salt to water; mix until dough is formed. Make a ball of dough in your hand; flatten to small patties. Heat oil in skillet over medium high heat, cook until browned on both sides. For the bean broth to thicken, stir in any root vegetable such as potato, or spinach. During cooking, stir, dilute well. If you can’t find cargamanto beans, use any large red bean. Learn to prepare the traditional Colombian dish, specifically from the kitchens of the Antioquia region. It’s very easy to do and will satisfy even the most ferocious appetites. 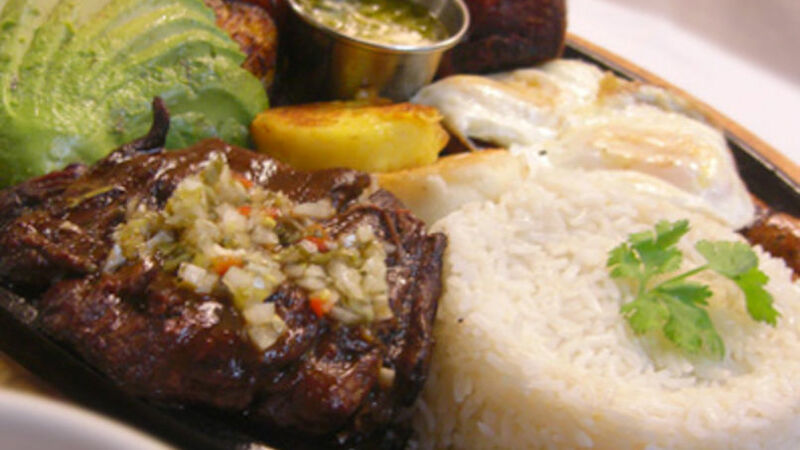 Generous is the best word to describe the bandeja paisa. It’s plentiful, full of different flavors, comes in big serving sizes, which is why it’s always served on a big platter. "The components never vary and preparing it isn’t difficult. The most important thing is that the beans are well prepared," said Mariana, a native of Pereira, and who lives in Astoria, New York. It’s traditionally served with beans, white rice, ground beef or grilled beef (sometimes both), chicharron (pork rinds), sausage, sweet plantains or tostones, fried egg, avocado and an arepa (white or yellow). "You have to eat with good appetite, because there is no such thing as a half portion. If there is some leftover, save it for the next day," adds Mariana. In 2005, the Colombian government raised the idea of naming the bandeja paisa as the national dish. But critics were quick with their objections, arguing that only a percentage of the Colombian population eats it, and that it originated from a just one region of the country. Regardless of whether or not it’s the national dish, it’s without a doubt the most generously proportioned of all Colombian dishes.